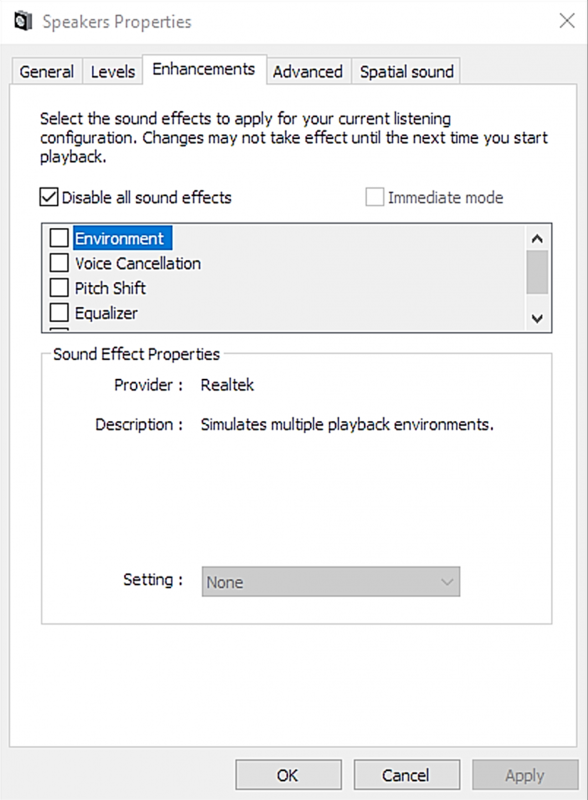 This page shows you how to fix bad audio from Realtek drivers on Windows. It is tempting to imagine that the Windows modern audio interface (WASAPI) takes account of present-day fast CPUs and allows sharing of audio devices between programs at high quality, using good sample-rate conversion and audio mixing. It does not. In the case tested briefly here, the stock Realtek driver (“Reaktek High Definition Audio Codecs R2.81“), in use on countless motherboards and other embedded applications, demonstrates genuinely audible problems, even to a fellow with typical hearing of a fifty-three year old. On searching the Internet for information about this problem, I found none, so decided to document it for you here along with a simple, but not immediately obvious, solution. This effect was discovered after editing a voiceover. The playback from the audio workstation, which directly addresses the computer’s sound output without the use of the WASAPI interface or any of its logic, seemed clean. But playing back through any media player on the same machine, using the WASAPI driver in shared mode, resulted in what sounded like filtering of the top end, and a phase distortion not unlike that heard in a multiband broadcast compressor. By a process of trial and error, I found where the problem was. This probably applies to any Windows computer using Realtek components. Please read this, and restore cleaner audio to your listening experience. The Realtek audio driver contains a number of ‘enhancements’ (in other words, effects or distortions) for non-audiophile users to enjoy. These include reverberation, response selective amplification (or EQ), pitch shift and others. There is also an option to disable all enhancements, at which point the selection list becomes inoperative. You MUST choose the option to “Disable all sound effects” to achieve high quality playback. Merely leaving all the effects deselected causes noticeable frequency and phase response problems, which become even clearer when tested. Here is the output spectrum of my test. Audio is white noise, and uncompressed linear 24-bit WAV files were used throughout. 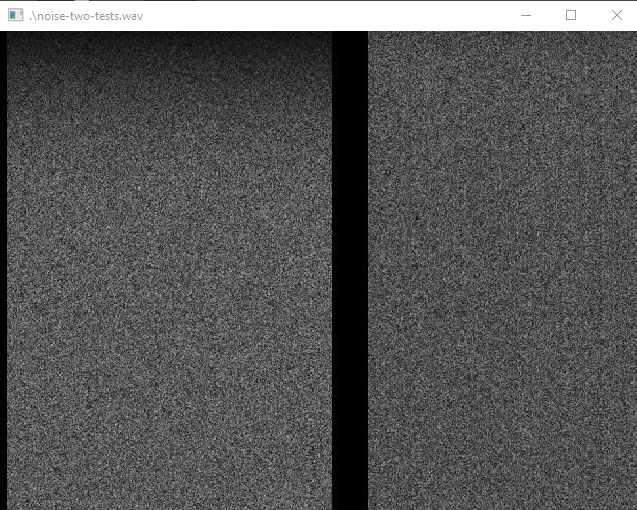 The first example, on the left, is 48kHz-sampled white noise played with all enhancements off, but without ticking the “Disable all sound effects” box. You can see that there is a marked roll-off of the higher frequencies. I have not tested for phase shift, but listening to speech also gives this problem. When the “Disable all sound effects” box is selected, the audio is passed through without any change to frequency response, and informal speech testing indicates that the phase distortion is also removed. I cannot emphasise this enough. The default Windows audio playback through the Realtek driver is appallingly bad, unless this simple adjustment is made.